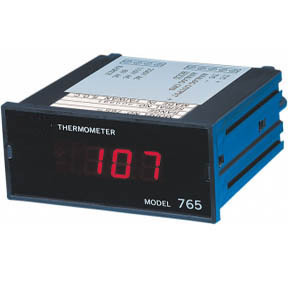 Panel mount digital thermometer with analog voltage output of 1 mV per digit, with analog output accuracy of ± 0.2%, features a bright red LED display and 1/8 DIN plastic housing. °C/°F selectable via plastic jumper behind front bezel. Available in types. J, K, T, E, and 3-wire Pt-100 RTD. Ambient range 0 to 60°C. 115/230V AC operation.